The World of Miss Mindy combines Disney characters with the unique design twists of its eponymous artist. Her cartoon folk art style puts a fresh, whimsical bent on childhood fantasies, painting timeless scenes in a modern light. Alice, the White Rabbit, the Cards, and the Queen, this set has them all – kind, crazy, and mean. Handcrafted and hand-painted, these stone resin figurines measure about 4 to 10-inch tall and are made to last. This limited-edition set is sure to go fast! 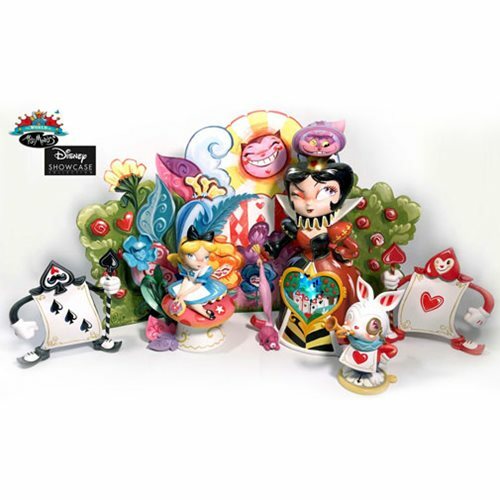 The Disney The World of Miss Mindy Alice in Wonderland Deluxe Statue Set comes in limited edition packaging with a display backer card. Requires 3x "LR41" batteries, included.